No matter what kind of disaster you experience and no matter how big or small, our team is trained and equipped to handle it. If you have a disaster in your home or business, give us a call. 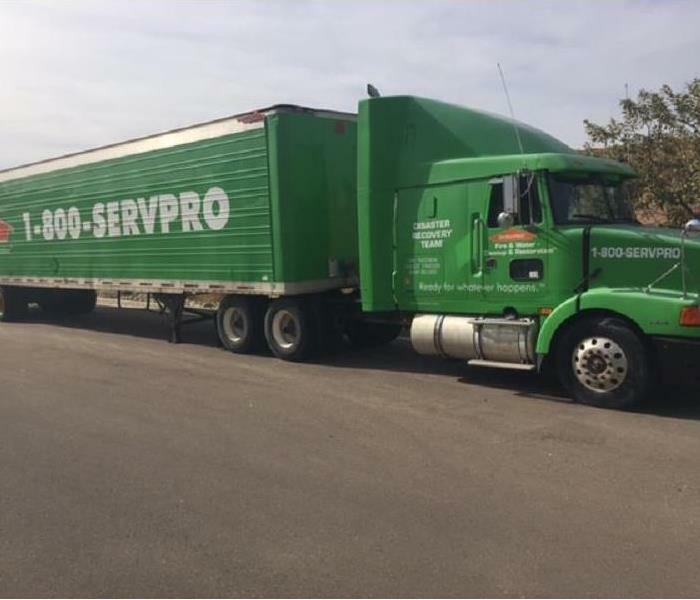 No matter when your disaster happens, the crew of SERVPRO is ready. We are available 24 hours a day, 7 days a week, 365 days a year to respond to your call. We are faster to any size disaster. 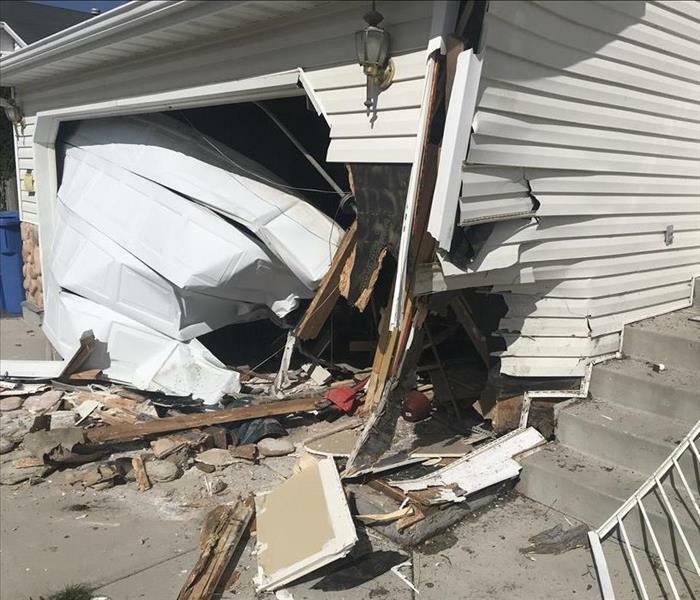 This home was damaged when a car struck the garage. When you have an opening like this in your home, the first thing that you need to do is secure it. 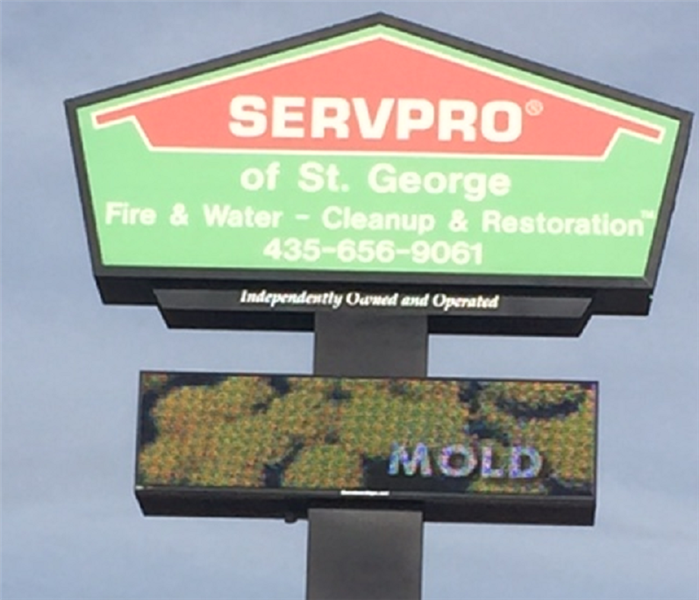 SERVPRO of St. George offers board up services. When your home has a moisture problem that isn't taken care of right away, mold like this can begin to grow. When you find mold like this, don't wait, call SERVPRO. We are faster to any size disaster. 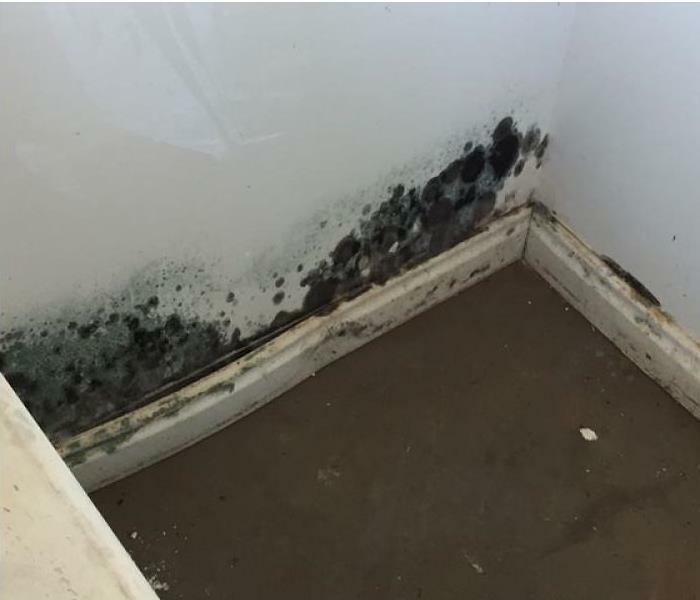 When you have a mold problem, the most critical part of preventing further problems is to deal with the moisture that is the underlying cause. Don't wait. Call SERVPRO. We are faster to any size disaster. We want to make sure and protect your home when we are working to restore it after a disaster. 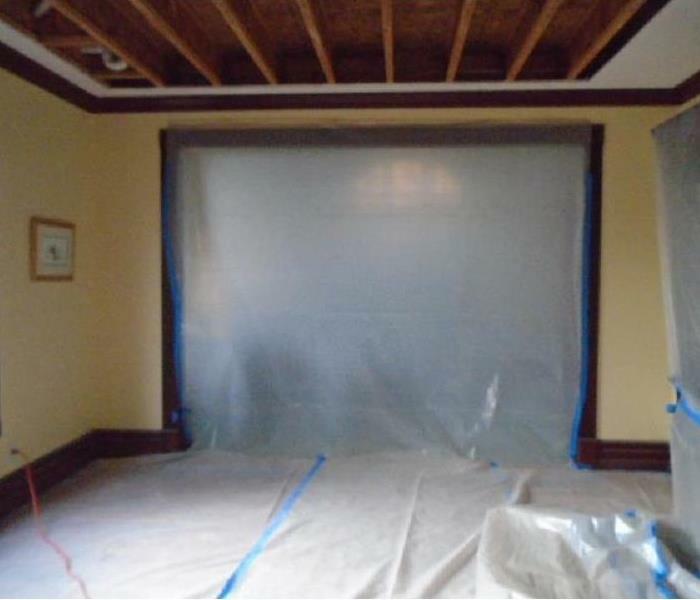 In order to keep contaminants from migrating into uncontaminated parts of your home, we use containment barriers like this. 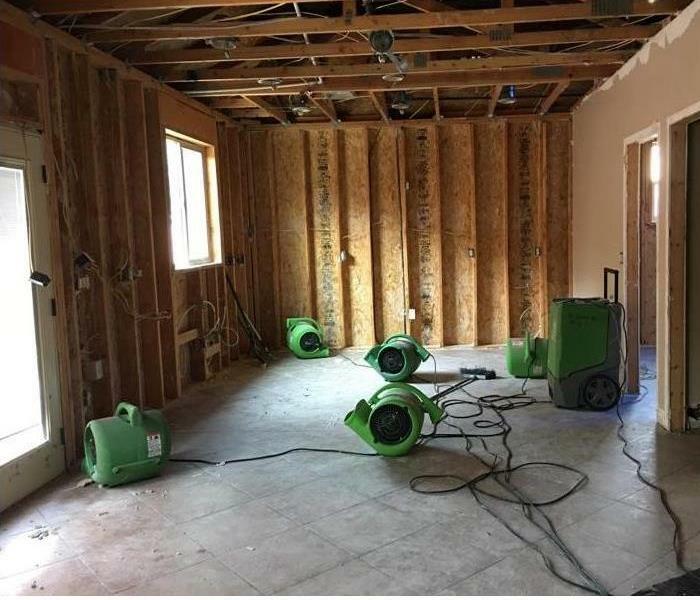 Our team responded to a water loss at this residence and we brought drying equipment such as you see here to help dry the home quickly. Leaving moisture for too long can cause secondary damage, such as mold. We often use equipment such as what you see pictured here to help the drying process to move more quickly. We do this to mitigate further damage to your home. If you have a water loss, call us! When you have a water loss, it is critical to deal with the moisture within 24-48 hours, otherwise, secondary damage such as mold can occur. That is why we use equipment such as this air mover to aid in the drying process. This home was damaged by flooding from a stormwater intrusion caused by heavy rains from severe storms that impacted our area. Our team was brought in to help with the cleanup and repair of the home. 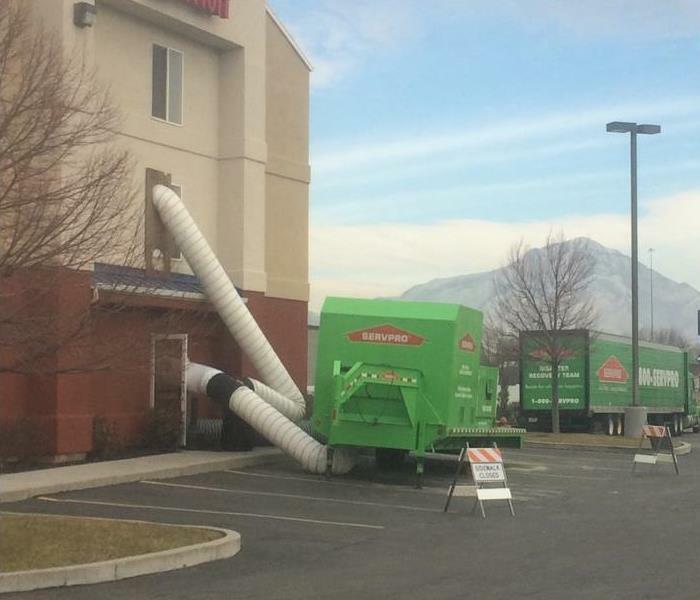 SERVPRO of St. George is ready for storm and large loss opportunities. We deploy the trailer when we need to have a lot of equipment on hand when a commercial building is flooded or suffers a fire. Water loss always happens at the worst possible time and now with the holidays coming up, you can never be too safe. 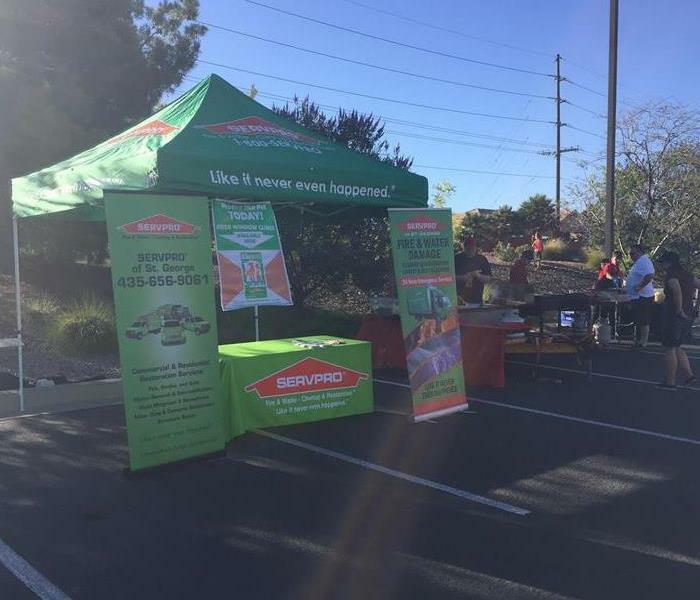 SERVPRO is ready to help when disaster strikes! Give us a call anytime, we're always available. Damage to the outside of a home after a fire in St. George. 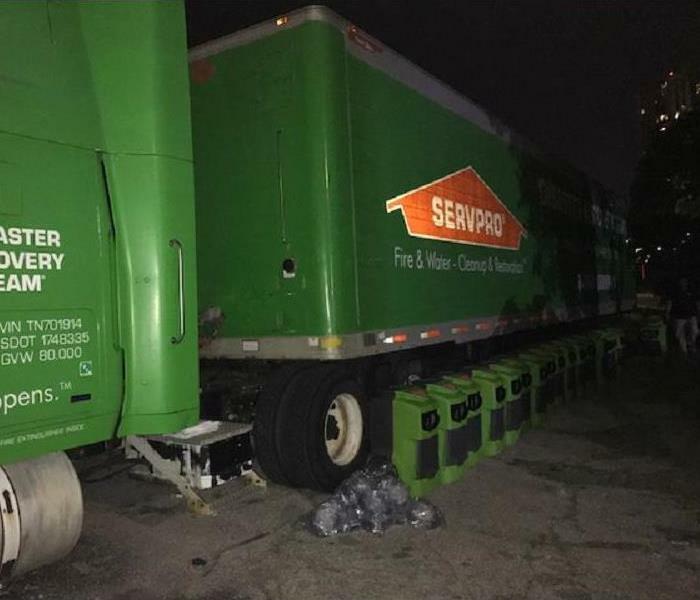 SERVPRO responded and quickly arrived at the scene to start the fire damage restoration. 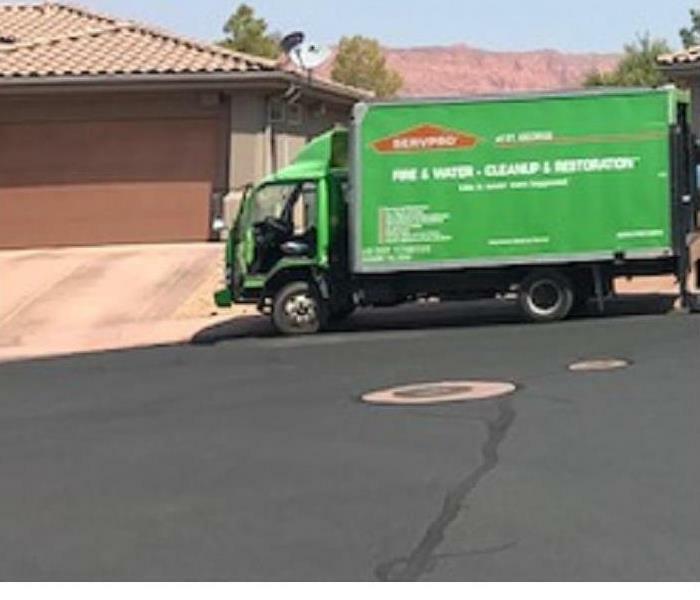 No size fire damage is too big for SERVPRO! When we say that we are faster to any size disaster we mean it. When you have a loss, no matter the size, we will be on the way with everything we need to make it "Like it never even happened." Commercial loss? No problem. Give us a call! 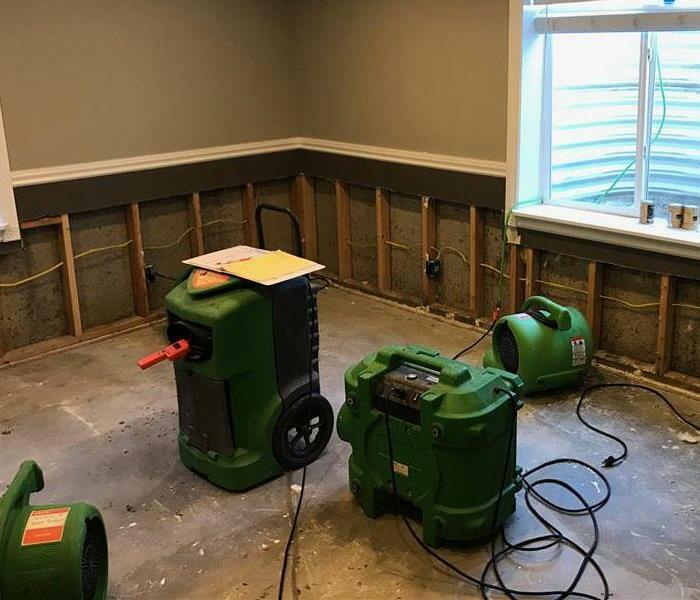 When disaster such as this commercial water loss strikes, you need a fast, professional response from a company that cares. We are faster to any size disaster and ready help you when you need us most. A few of the rooms in this hotel were damaged by water from a broken toilet in one of the bathrooms. We brought in all the necessary equipment to make sure that when we left, it was "Like it never even happened." The facility pictured here was damaged by water when a pipe burst, flooding the inside. When we arrived there was still water standing inside the facility, but we were able to quickly remove the water and repair the damage. This facility suffered a large water loss and the owners needed a quick response. 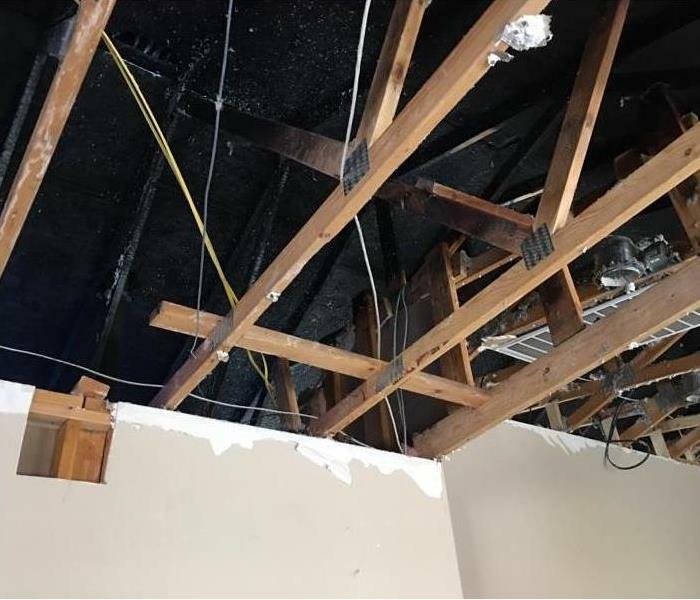 They called us and our dedicated team of technicians went right to work to effectively mitigate the damage done to the facility. In this picture, you can see a line of air scrubbers next to our tractor trailer, that have been staged for use in a commercial facility that suffered a heavy loss. If you need assistance with a commercial loss, call us! 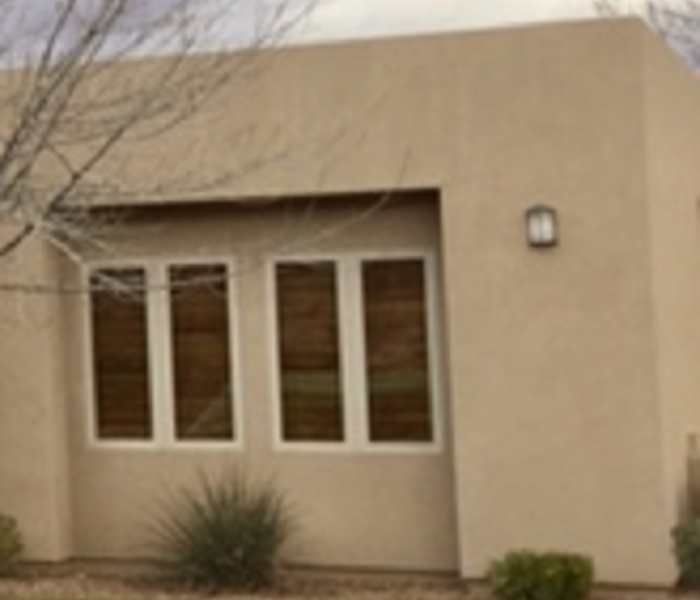 Here you can see the restoration in progress on this fire damaged home. As you can see in this picture, we have completed the demo process and are getting things prepared to put in new material. Here you can see a containment barrier that we have put in place while we are working to mitigate the damage of a mold loss. We always make sure to do this to keep contaminants localized. This wall had mold that was the result of a serious moisture problem. We found and removed all the moisture as well as the mold. We then went in and replaced all the damaged material. If you have a mold loss, you need professionals who are ready, trained, and equipped for the job. 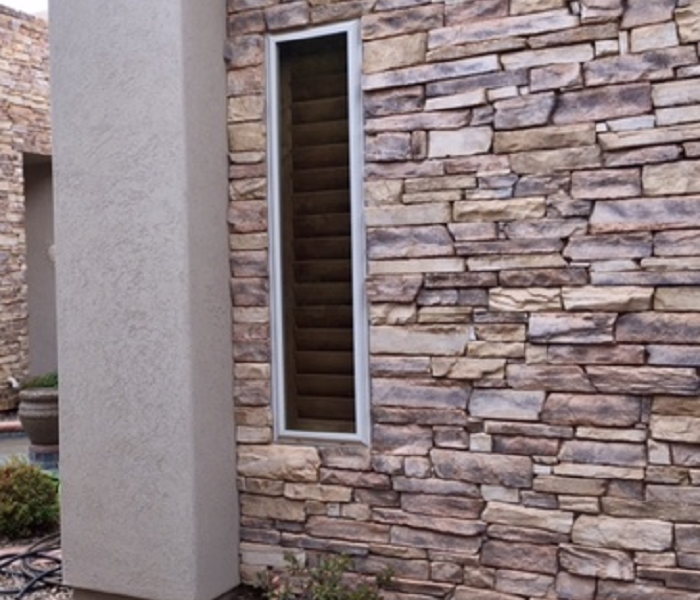 Our technicians are highly skilled professionals that are committed to making your home look "Like it never even happened." 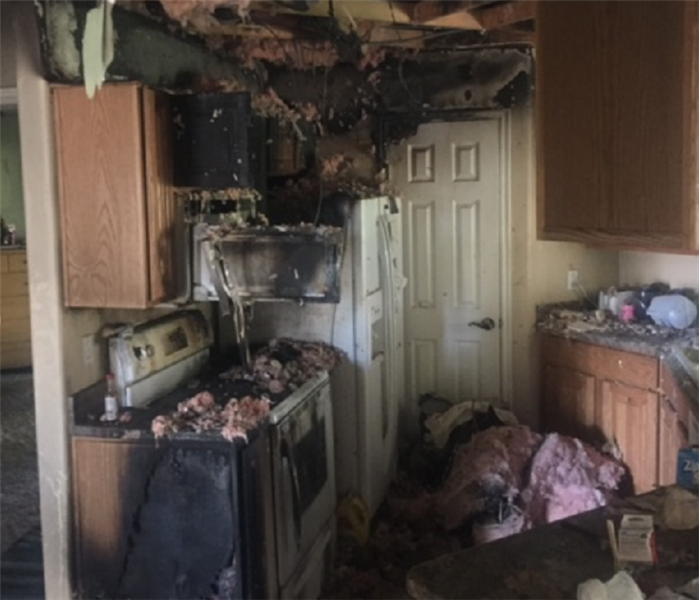 In this picture you can see a kitchen that has heavily been damaged by a fire. It was contained quickly, but you can see the extent of the damage that it still managed to cause. 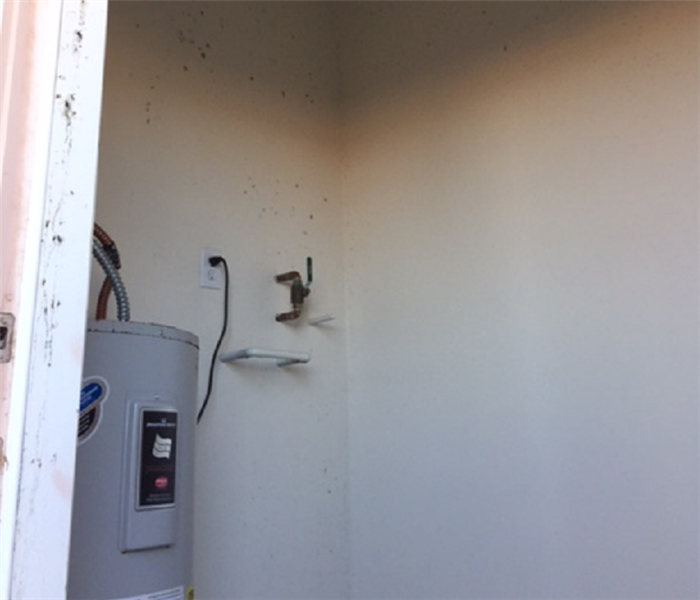 This water heater was leaking and creating an environment which was conducive for the mold pictured here. 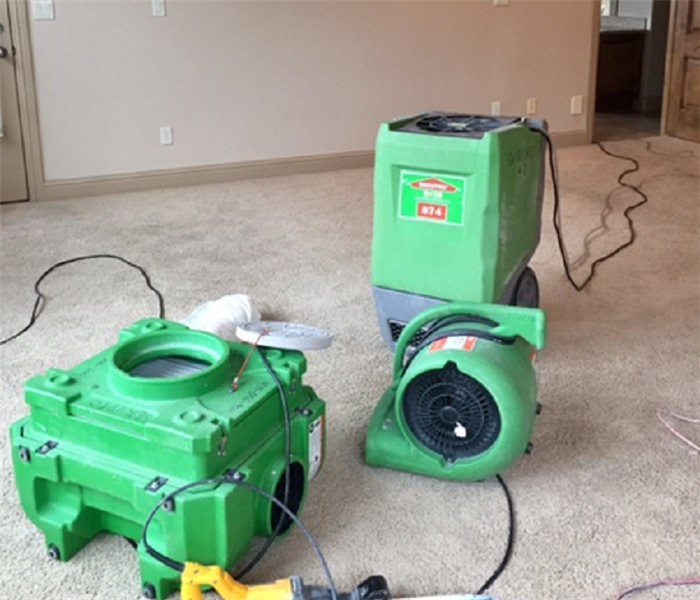 After drying up the moisture and removing the mold, we were able to restore this room to excellent condition. This homeowner had a serious mold problem in the kitchen. You can see from this image that the wall behind the lower cabinets was completely covered in mold. After removing the cabinets, we were able to remove the mold and repair the damage. 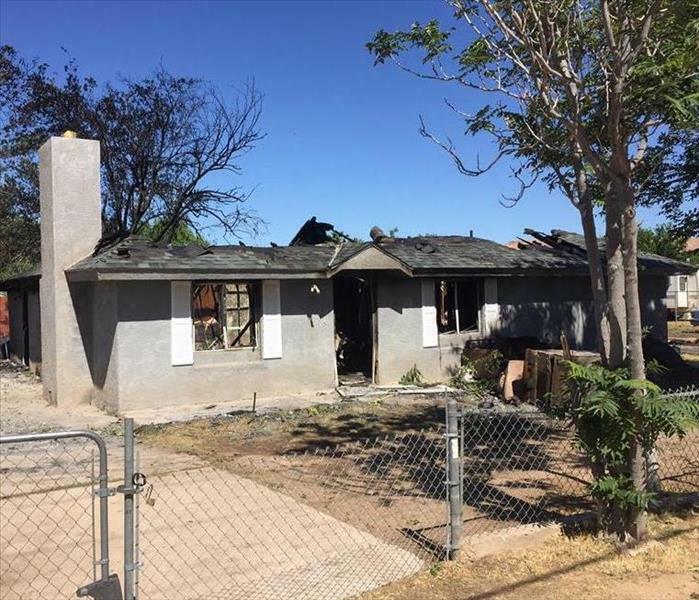 This home had a large fire that caused a significant loss for the owner. Notice the amount of charring on the underside of the roof sheathing and in the trusses. If you have fire loss like this, call us! In this picture, we are in the process of performing a fire remediation for this homeowner. As you can see, their belongings have been pulled out and placed safely in the garage so as not to be damaged while we work. The owner of this home called us after they had a fire loss. They had a kitchen fire that was contained quickly, but still managed to do quite a bit of damage to the home. 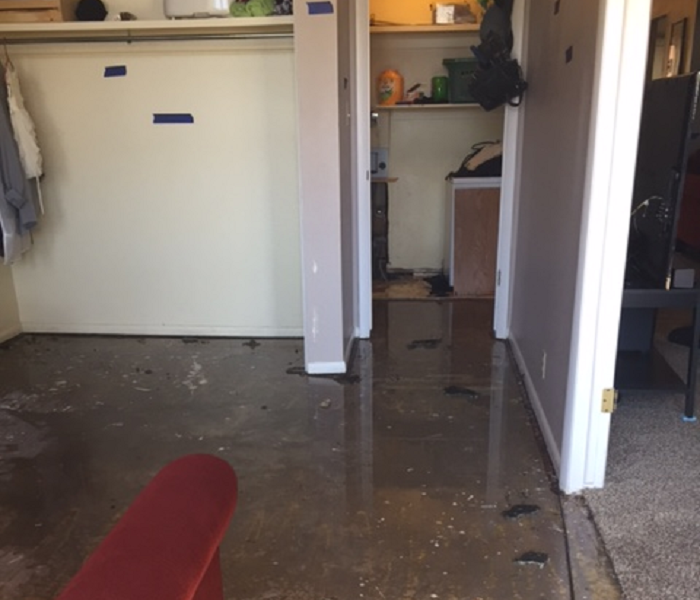 This office had a water loss that was the result of a malfunctioning toilet in their restroom. Most of the loss was in the bathroom, but the room that you see here was also affected. 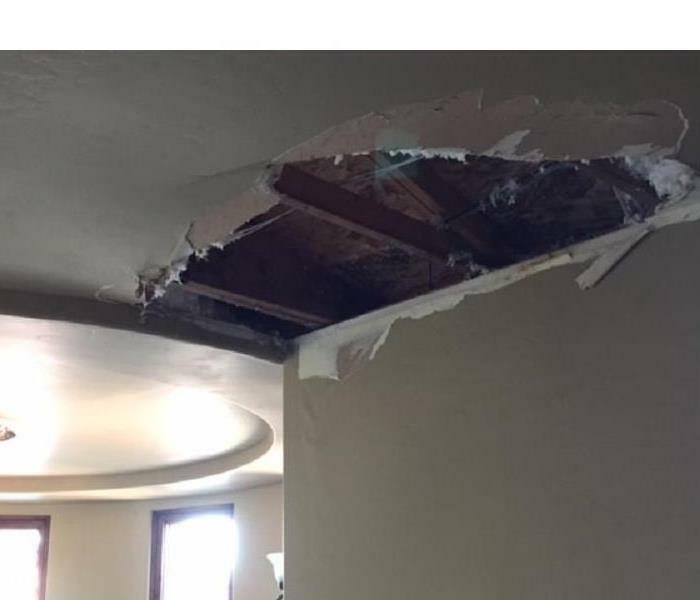 This home had a damaged roof that was leaking into the attic. The insulation became saturated and eventually the weight and the moisture caused the ceiling to break and water to come pouring through this hole. Can you see the moisture in this image? 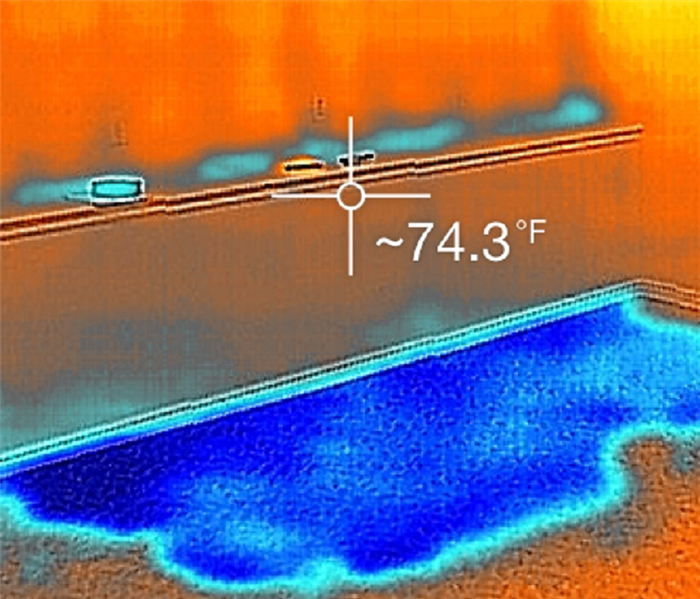 That is because we are using a FLIR Thermal Camera in this image. This is one of the ways we find moisture that you might not otherwise see. 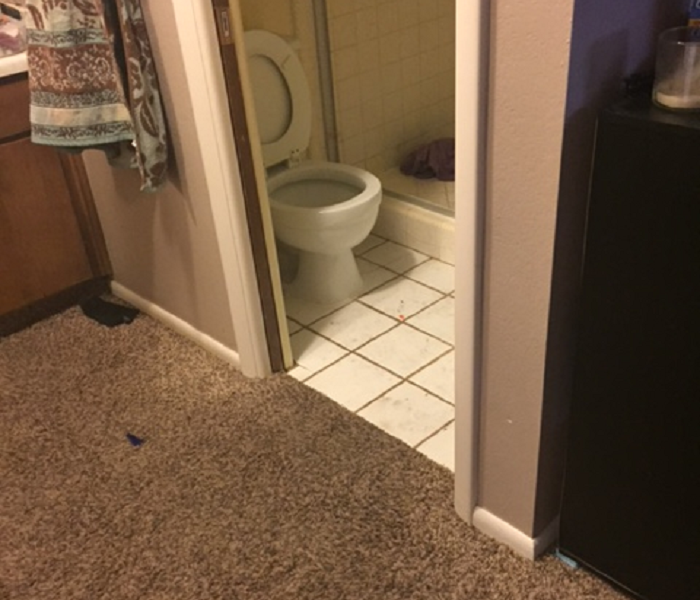 The shower in this bathroom developed a serious leak that caused water to pool in the floor and also affected the carpet in this room. The damage wasn't too severe, but could have been if the customer hadn't called us when they did. 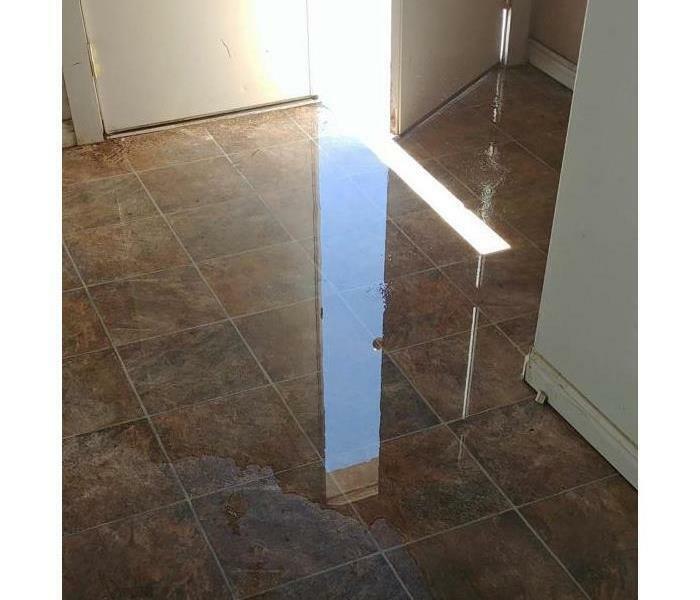 This facility had some water damage that needed to be repaired. 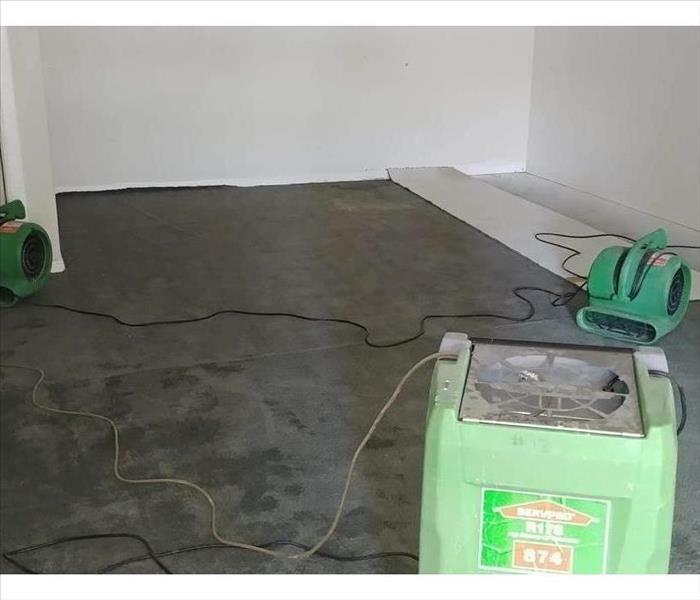 As you can see, we have pulled out the carpet and pulled out the damaged drywall and baseboard and are in the process of drying up excess moisture. This bedroom carpet was soaked as a result of a pipe break that flooded part of the house. Pictured here, we have brought in fans to dry up the excess moisture before beginning the cleanup process. 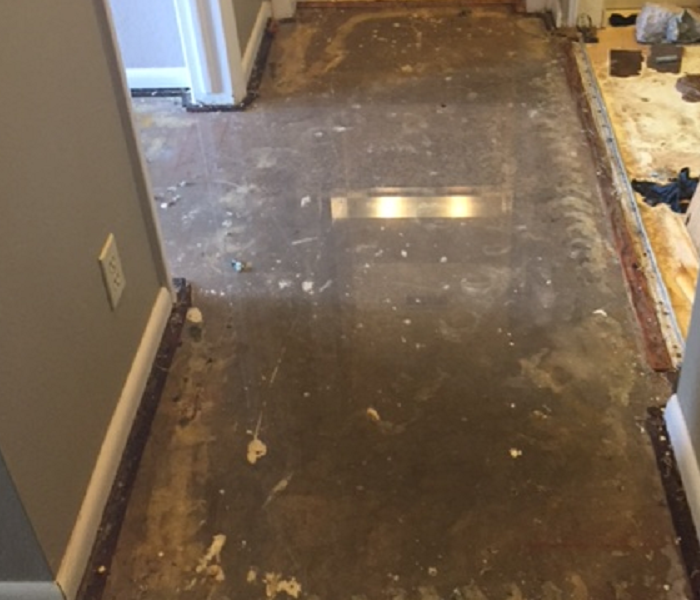 When recent storms caused flood waters to enter this home, it damaged floors and walls in several areas. In this picture you can see one area that was affected by the water that came into the house. 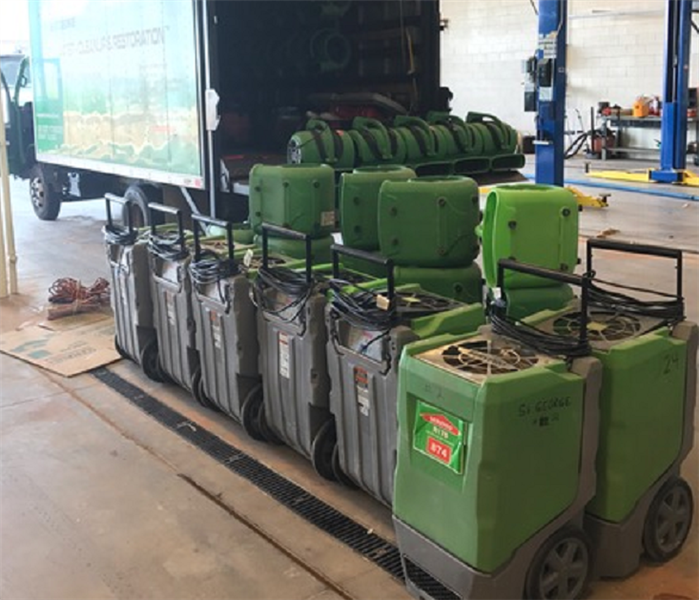 In this picture, you can see air movers, fans, and air scrubbers being loaded into the truck in preparation to head to the site of a home that had suffered flooding due to recent storms. This home suffered damage to the exterior caused by high winds from a recent storm. If you have storm damage, call us. We will be more than happy to come make it "Like it never even happened." Debris from a recent storm blocked the drains in this facility, causing water to pour inside and flood the interior. Notice the amount of water still standing in this room. This image was taken when we first arrived. This roof was damaged by high winds from a storm that recently came through the area. 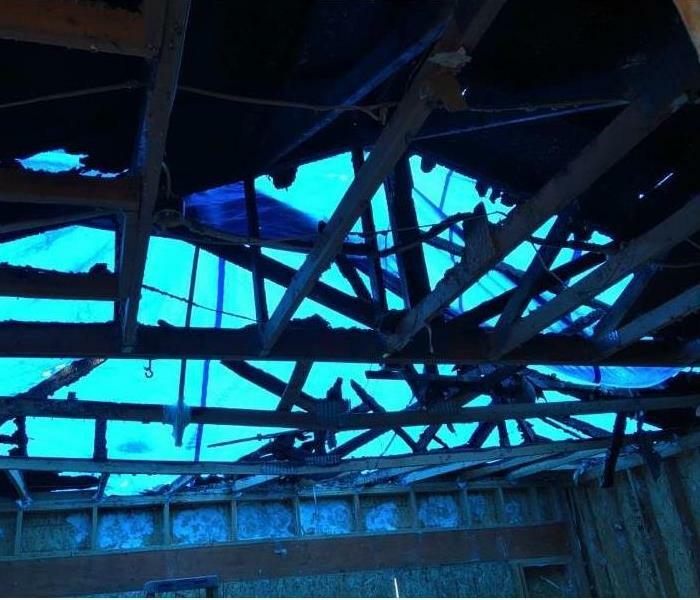 Shingles and roof sheathing were torn from roof of the house leaving heavy damage and a rain soaked interior. 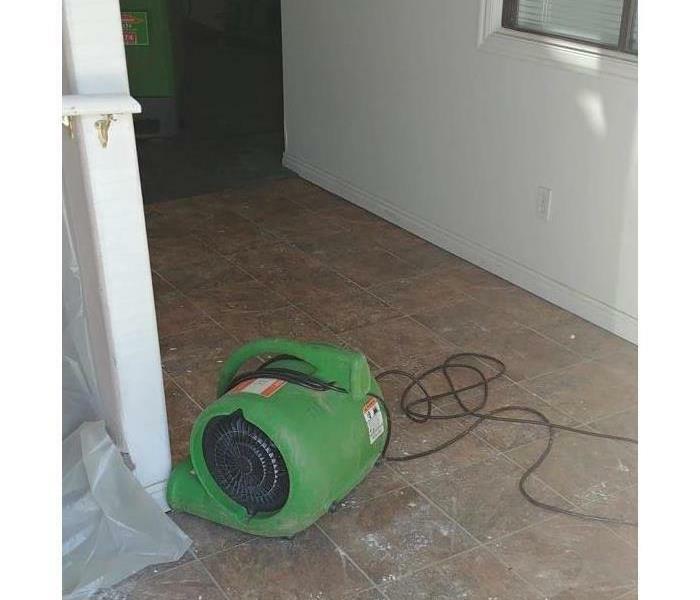 The carpet in this image was damaged when a storm blew through the area, causing flash flooding that affected this facility. When we first arrived on the scene, water was still standing inside the facility. Fires are typically much worse than a water damage, with water, a lot of the items can be repaired or restored. Fire however destroys most things that it comes in contact with. This house was a total loss. Some of the items in the house were able to be salvaged. 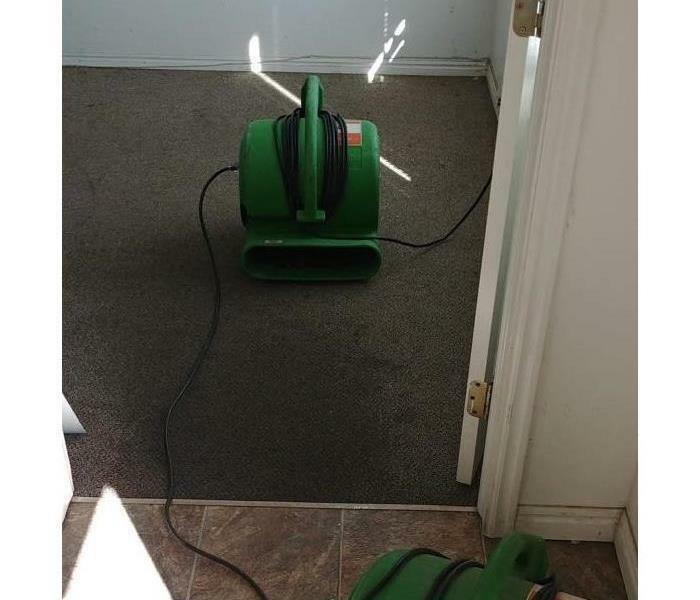 For assistance or questions call SERVPRO and we can help make it "Like it never even happened." Mold grows when there is too much humidity or after a water damage. 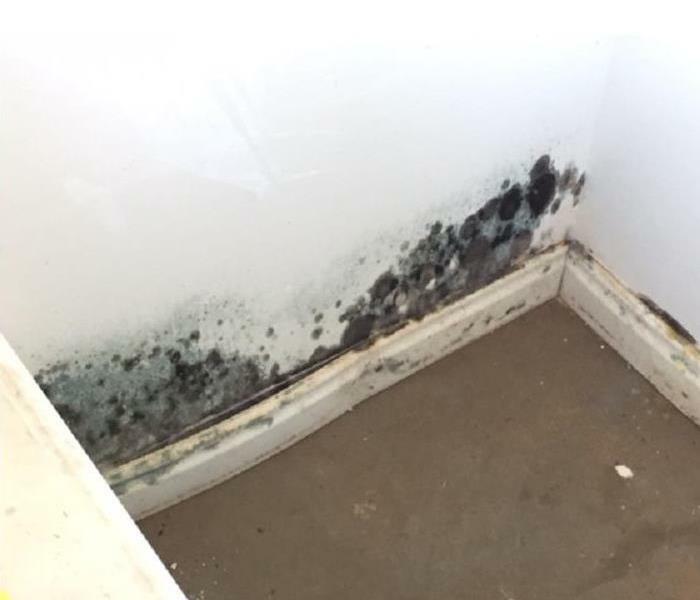 This mold started to grow as water kept intruding from a small leak that progressively got worse. Because the closet was full the homeowner did not know the mold was present until it grew high enough to see. 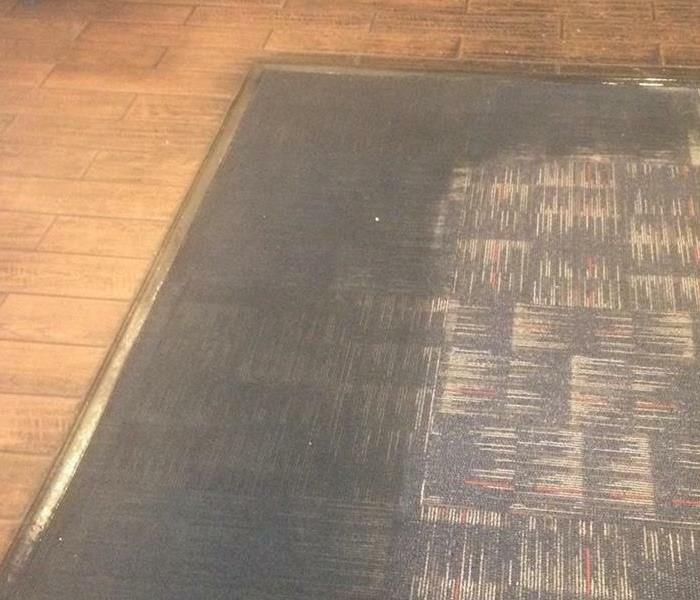 This dirty carpet looked as if it had no hope. The business owner didn't believe it would get clean but we got the job done. 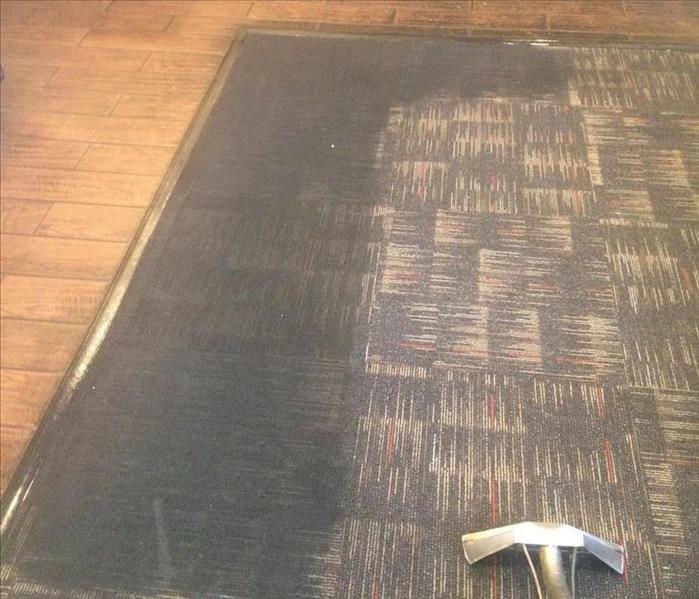 The business owner was overjoyed with the way the carpets turned out. This is just a few of the people who came and enjoyed Breakfast on Saturday morning, June 10th. The local Harmon's Grocery provided all of the food and also some individuals to help with the cooking! Thanks Harmon's!! 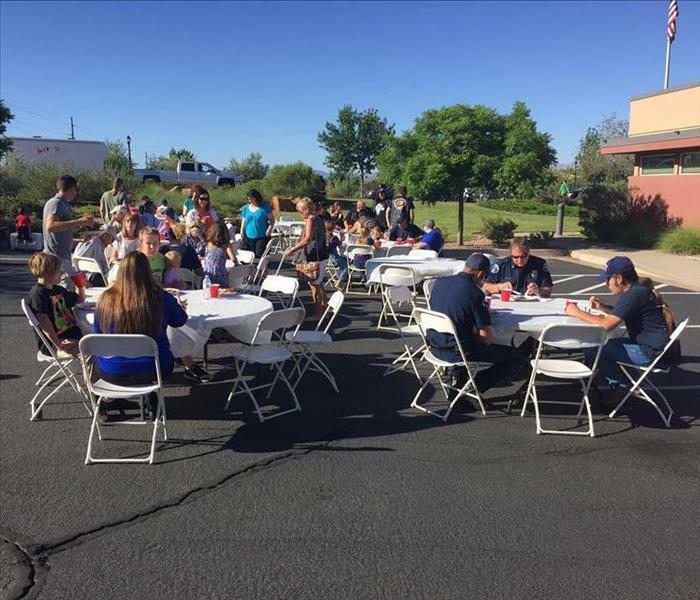 We were able to host the first of many planned Emergency Responders Appreciation Breakfast this past weekend. We had great support from many local businesses and individuals. This picture was from early in the morning, waiting for people to arrive for breakfast.